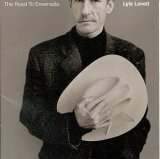 Lyle Lovett's latest outing The Road to Ensenada floats through a variety of musical styles from jazz (Her First Mistake) to country-rock (Don't Touch My Hat) to big band with a country twist (That's Right You're Not From Texas). Lovett has been bending genres for years making him difficult for the media to classify. Still, he's managed to build a loyal following for his quirky music and lyrics. Although his previous endeavor I Love Everybody garnered a better collection of reviews, The Road to Ensenada is a better, more comfortable effort. For starters, its songs are more memorable and infectious. Just try to shake Fiona or Private Conversation, for example. Better still, the album definitely captures the feel of an early Jackson Browne effort, though it's mixed with The Byrds' Sweetheart of the Rodeo and Lovett's own sense of humor. The similarity to Browne might be attributed to the presence of bassist Leland Sklar and drummer Russ Kunkel who made up the rhythm section of Browne's band for years. In addition, Browne makes a backing vocal appearance on Fiona as does Chris Hillman on Private Conversation and I Can't Love You Anymore. It's a minor masterpiece. The Road to Ensenada available from Barnes & Noble.